The Canadian Peregrine Foundation was formed in Ontario in 1997, and expanded into Quebec in 2000. While CPF has not yet had an opportunity to carry out programs in other provinces, plans to do so are underway. In some other parts of Canada, local groups have already established monitoring programs and websites of their own. These are listed below at left in the "Links" column; if we have missed any, please report them to us. The primary purpose of this page is to provide a forum for reporting observations of peregrines at sites which are not already being monitored elsewhere. We need your help to keep this page active. If you have peregrine sightings to share from anywhere in Canada, please e-mail us your reports. Fraser Shuttleworth reports: Hey seeing as how this is the "Canadian" Peregrine Foundation site, I wanted to pass you a sighting I saw last week (might as well get some from out of province eh). I was up a Ruthford mall in Nanaimo last Saturday (please excuse the delay) and saw a large peregrine lapping the south end of the mall. Was probably looking for pidgons. I'm headed back up there today and I'll keep my eyes posted for more birds eh. John Bennett reports: I was fortunate to sight this Peregrine falcon on Sat Mar 3rd. The location was Halls road in Whitby just before Noon. 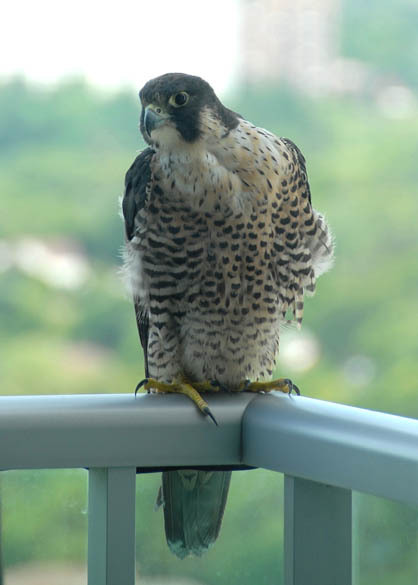 Mark Nash comments: With many thanks to the NYDEC, we have been able to put a name to the juvenile peregrine falcon that has been spotted and photographed by John Bennett. A huge thank you to John for the great photos that he was able to shoot. The young juvenile peregrine falcon’s identity has been confirmed by its colour leg band number as being a female peregrine that was produced in Rochester New York at the Kodak nest site last year - 2006, and her name is Rhea Mae. She has two other sisters hatched at the same nest site last year. Arjun Bharioke reports: I have been spotting two peregrine falcons outside my house, in Toronto, for the past ~2 months. I live in an apartment building overlooking the Don Valley, at Don Mills and Overlea, and the peregrines have been perching on top of a second apartment building, next door. They appear to consider this area part of their territory, and I have seen aggressive territorial attacks against some of the (previously resident) red-tailed hawks. I believe that there are two birds, though I have not seen both of them present at the same time. Through my spotting scope (admittedly not very high power), the two birds appear to be quite different in size (i.e. one female and one male). I have attached some pictures of one of the birds that I have taken through my scope. Unfortunately, I do not have a good picture of the second bird. I hope that this turns out to be a new pair, as it would bode well for the Peregrine Falcons in Canada. (I also hope that they will nest here in the spring). Rudy Kruppa reports: We see Dundas & Thunder on pretty much a daily basis, but yesterdays display was quite a sight. On my way toward Waterloo(8:30am) both birds were gliding beside each other heading towards City Hall. They looked like two fighter jets in formation cruising at about 75ft. Later in the afternoon we witnessed both birds doing the same thing but this time they were approaching between City Hall and the new WLU campus(the old St. Jeromes school which houses at least 40 pigeons) It appeared as though Dundas took up the front to flush while Thunder came in behind to do the dirty work. For approx. 15 minutes Albert & I watched as they stooped through the flock as least 5 times. Unfortunately we did not see them put anything up.There is no question that they are hunting cooperatively. It keeps looking better & better that we'll have a P/F family in Kitchener nesting this spring !! Had the most wonderful experience this afternoon thanks to Dundas! I work on the 2nd floor of the RBC building here in Kitchener. About 4:30 this afternoon, we were startled by a loud "bang" on the window. When we looked out, there was Dundas sitting on top of one very dead pigeon. He glared at us as we all stood there admiring him, them hop-dragged the pigeon a little farther away on the roof to commence feeding. Dundas is looking very well fed, sleek and sassy. What an amazing bird, to have survived the loss of a foot and part of his leg, yet still manage to do his bit to keep the pigeons in this area on their toes! Actually, Dundas and his partner have been littering the area around the RBC building with plenty of pigeon wings and claws this summer. I even found the remains of a Crow's tail one day. What a great opportunity it was today to see him up so close -- only about 10 feet away! Rudy Kruppa reports: We're still getting pretty much daily sightings of either one or both peregrines. Both birds were sitting together on the same RBC sign on Monday for over 2 hours. At one point the one bird took a little rest on it's side (had to be Dundas) before giving the pigeons a little exercise. Looks like they're here to stay for the winter. There was quite a show today from what I would assume to have been Thunder the American female as the bird had both feet. I received a report from Terry that just after lunch today a peregrine made an amazing kill downtown. Apparently the pigeon was the largest he's ever seen, so large that the peregrine could not carry it away after the kill and landed on a grassy spot at the corner of King & Frederick St's. to devour her lunch, much to the amusement of several onlookers. After about 10 minutes of eating she finally got tired of all the attention and being as the kill was about 1/3 lighter off she went to a higher perch to finish the rest of her lunch. Things are looking better & better for a nesting pair for Kitchener in 2007. We'll keep our fingers crossed ! (The Webmaster reports:) Click here for an article about Dundas in Kitchener. Rudy Kruppa reports: Just a quick note to let you know that Dundas is still coming into town once in a while. He is at this moment perched on his favorite RBC building sign and was spotted by Albert around Aug 8th with a pigeon kill on the same sign.Today is the first time I've spotted him since I returned on Monday. Dan also left me a voice mail before he went on vacation letting me know that he spotted Dundas and another PF soaring above the TD building on Aug 8th as well. Hopefully we can spot the direction he goes in when he leaves the area again. Rudy Kruppa reports: Just a quick note to let you know that there was a PF on the RBC building sign(east side) on Wed morning . Halfway through the morning it moved to the south face but it had its back to me, and I couldn't see it's breast markings. The back was a blue slate color so it could very well have been Dundas as opposed to the young female. It was also back this morning, but unfortunately I'm so busy I can't get away to get a closer look. I have called and asked the building operators there to keep an eye out for me while I'm away for the next 3 weeks. Sorry but thats about the best I could do this week. Rudy Kruppa reports: I just wanted to give you quick update here in Kitchener. Since my return from vacation last week I have not seen Dundas or his young female companion since I left at the end of June. My last sighting of Dundas was on June 15 and about a week previous to that the female was only downtown every other day or so(from what I could observe). Now that I'm back I have not seen either bird and my good friend Albert here at City Hall has been keeping a close eye in my absence and has not seen anything either. 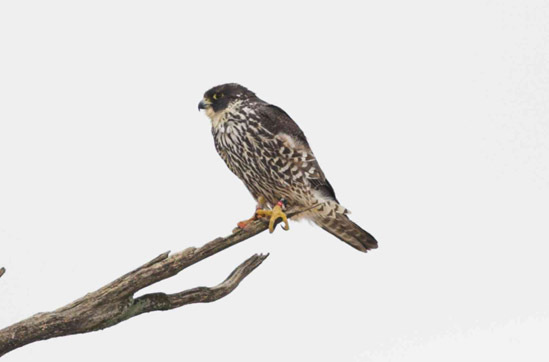 Mark Nash reports: On Friday June 2nd/2006, we were finally able to verify the leg band numbers from the sub adult female peregrine that has been a resident of Kitchener for the 10 plus weeks. This is the one that has been observed in courtship activities with the one legged adult peregrine named Dundas. Dundas was produced at the Hamilton nest site in 2004, and some time after fledgling the nest, loss his right leg. With many thanks to our friends in Kitchener, - (in particular, Rudy and Albert), the sub adult females leg band ID was finally clearly read, and she has been positively identified by the DEC in NY. I spoke to our good friends at the DEC in Albany New York regarding her band number and she has been identified as a 2005 hatch bird from the Syracuse N.Y. – (State Tower Building nest site). She was named “Thunder” by the Syracuse nest site attendants. Surprisingly, this is a full sister – (same nest & hatch year) of the new 2006 resident nesting sub adult female currently at the William Osler nest site in Etobicoke this year. This sister was named “Juliet” by the Syracuse folks. 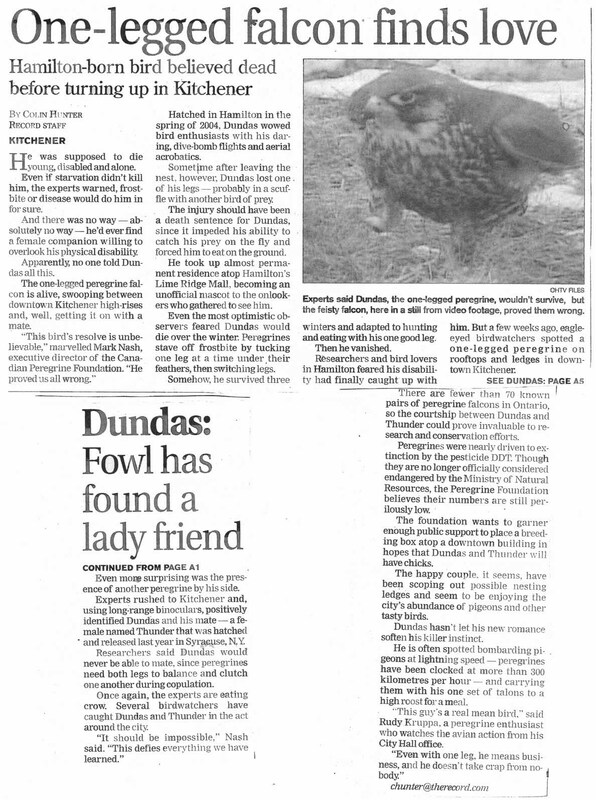 Needless to say, the folks in Syracuse are delighted that two of their 2005 hatchlings have been discovered. 2005 was the first year that they were able to band the hatchlings. 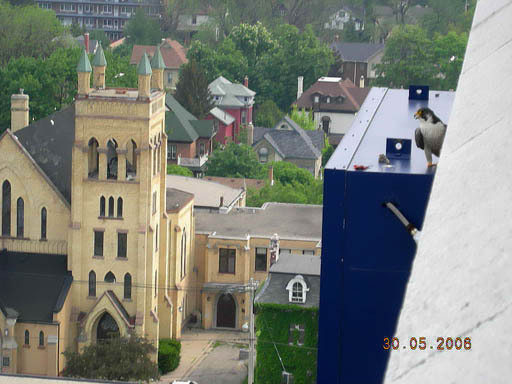 Mark Nash reports for Rudy Kruppa: I thought you all might be interested in this update now that we have confirmed the identity of at least one of the territorial peregrines that has been gracing the skies in downtown Kitchener Ontario these past 5 weeks. While the pair has been very active in the Kitchener downtown core, they are not currently nesting as best as we can tell at this point. Their presence has been very apparent over the past 10 days as the increased e-mail communications of their activities has more than doubled. They have been difficult to identify due to the height of urban landscapes involved. It has been confirmed that the adult territorial male is non other than “Dundas”, a one legged peregrine that was produced at the Hamilton Sheraton Hotel nest site in 2004. At some point after his fledge and disappearance / dispersal of the Hamilton Sheraton Hotel territory, Dundas was first observed at the Lime Ridge Mall in upper Hamilton –missing one of his legs. Not only has this little bird beat the odds and survived the past 3 Ontario winters on territory on the Hamilton Mountain area,,, it now appears that he has taken up residence and attracted a sub adult female companion. It looks like he has once again defied the odds, (given this bird’s obvious disability/handicap). While is still very difficult to positively identify this male Pefa without reading the black coloured band number, we are not aware of any other “one legged” peregrines in the neighborhood. We have allot of colour video footage that was shot of this bird and submitted by a member of one of the local Hamilton TV/cable networks, in addition to the many independent observations and photos that have been submitted over the past two years. Dundas has quite a following indeed!! This is a “tough little bird indeed”, as the last report that we had received on Dundas was approx. 10 weeks ago from Hamilton, where he was observed stooping on, and successfully killing a large pigeon. While he struggled to carry this very large prey to the shopping centre plaza rooftop, he was observed feasting on it atop of the plaza roof shortly after landing. Minutes later, he was both observed and photographed leaving his fresh kill, and chasing off two adult crows that had taken an interest in his meal. One of the crows was knocked to the ground in a spectacular hit. The crow was recovered by the observer, but had obviously died on impact as a result of Dundas’ strike. Dundas was observed returning to his kill on the plaza rooftop corner and finished his meal. For the first winter, Dundas was constantly being observed and photographed in the Mall area eating his kills at ground level, - anywhere and everywhere! At one point he was observed eating on the sidewalk, twice in the street/roadway and actually disrupted the flow of traffic – (much to the delight of the many motorists and those who came to Dundas’ aid as they stopped the traffic in an effort to protect him). Numerous reports were submitted by local Hamilton residents and business community members as they watched Dundas eating in the mall parking lot on a bench, apparently not able to carry his prey to safer elevations. This past year - 2005, Dundas has been routinely observed carrying his kills to higher elevations without any problems. You can see some of the video footage shot of Dundas as a juvenile on the CPF web site pages at the 2005 Hamilton Photo Gallery. It is a large download, but well worth the wait to see this little peregrine. This just goes to show us, that some of these birds have an incredible ability to overcome and adapt. We are monitoring the situation very closely, and will continue to update. Rudy Kruppa reports: Just to let you know both peregrines were here all day and really giving the pigeons a good workout. Over the weekend or early next week I'll try to get a spotting scope to see if any bands are apparent. Rudy Kruppa reports: I can hardly contain myself long enough to send this email !!!! We now have 2 peregrines perched in the RBC building !!! Unfortunately its raining pretty hard and I'm in no mood to get a soaking today. I'll keep you posted. 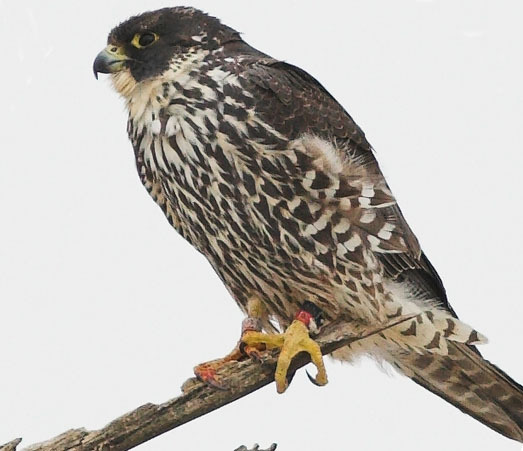 Ken Holliday reports: As you may recall the Peregrine Falcon was near extinction and brought back to endangered by projects like the release of young bred - some in Regina starting 1985. The birds were making a comeback and nesting of wild birds was starting to happen. Canada went from a low of a handful of nesting pair in all of Canada to several hundred pair at last count. Saskatchewan had 3 know nesting sites - Regina, Saskatoon, and Moose Jaw. Some parents proved more successful than others. Regina was unfortunate in 2002 when the female disappeared - she was old for a wild Peregrine - 13-14 years and normal life expectancy is 8-9 years. 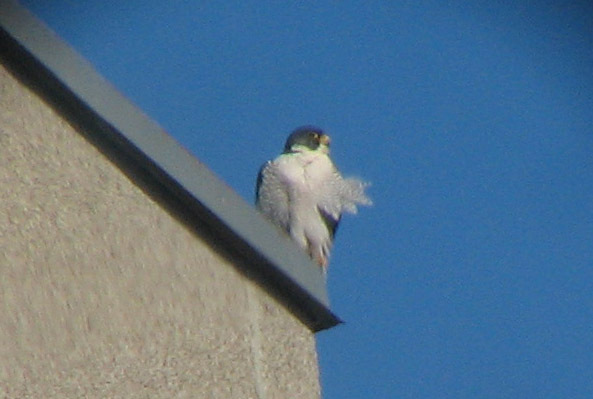 May 9, 2006 - I personally saw and confirm we had a wild Peregrine sitting on a east wall - top light fixture - Regina City Hall this afternoon. I am advised by City Hall maintenance staff that prey remains have been found for a few days now. I have been told there are 2 and I was not able to confirm the 2nd bird but the quick glimpse I did get make me think we have 2!!! Larri Woodrow reports: Today at 11am a friend & I spotted a pair of Peregrines patrolling the Richmond BC sky at the Richmond Marina. We were admiring a large number of mallards & pigeons feeding on grain handouts thrown of the riprap at the riverbank in front of the parking lot when the birds suddenly took flight. We knew we hadn't alarmed them, and when we looked up to search for the cause, we saw two speedy peregrine falcons covering a wide area in irregular, but somewhat circular patterns. I'm a member of Langley Field Naturalists. When I got home I searched the web for photos to make certain our sighting. Also on the web I found previous Richmond sightings documented. My first sighting of peregrines was in northern BC on the Kechika River in 1974. It's time your organization moved west to BC. Ken G. Holliday reports: Regina peregrines Return!!! We have at least one back!!! April 28, noon, I saw one perched on the city hall light bracket, south side - most easterly light!! I know the web site was not carrying the signal from the hack box after some power spikes a few days ago but that was fixed - keep an eye on the site and let us know if you see a peregrine there. We did have a Pigeon nesting there - they would make a nice lunch for the peregrine and I suspect they have vacated now as I have not seen them for since we made the camera live. City of Regina was doing windows chalking on city hall and have moved from the site in order to not disturb the peregrine if it returns. They are congratulated for their support!!! 2002 the female disappeared we assume she died of old age. 2003 there were 2 peregrines here but they did not nest at city hall and may not have nested at all - that is likely because of 2 things - 1 - it is not uncommon for a new pair to not nest the first year of a pairing & 2 - when the new female was checking out the hack box at city hall there was construction happening behind the hack box - welding and other activity that could not be avoided as the air conditioner needed upgrading or everyone at city hall would have been upset. There may have been more than one occasion where the temptation to look into the hack box was too much for repair & or city hall staff - this bit of exposure to humans would have been more than enough to cause them to desert the location. We do not have that construction this year. We keep our fingers crossed for a nesting at city hall this year. Ken Holliday reports: 2002 will be a very very bad year. The eggs from the Regina site, that were sent to Saskatoon show no signs of embryos as of Friday the 7th. They would definitely show now if there was to be any. been able to find any nest sites in either location, certainly not in the usual places and they birds are not incubating as they normally should be. They also report that Prairie Falcons confirmed nesting are also vastly reduced this year.. The guess is the very cold spring has been to blame. The hope in Regina for this year is - gone. next year we hope the male that is still here, still perches on the SGI sign, south side of the SGI building finds a new female and brings her to the territory. Marcel Gahbauer reports: The latest news from Ken Holliday is not good - it appears that the Regina nest box has not been visited by the female for at least a couple of days. It is not clear whether incubation actually began before she disappeared or not. If not, it is possible that they can still be rescued by placing them in an incubator; they are being moved to Saskatoon for this purpose. Two brown chicken eggs have been placed in the nest site to maintain the interest of the peregrines if they do return; if that is the case, and the chicks hatch, they will be returned to the nest. Marcel Gahbauer reports: Ken Holliday has notified us that around noon on April 12, he observed one or possibly two peregrines flying around Regina City Hall. He believes that one of them is the regular female "8B3", who is now 14 years old - an impressive age for a wild peregrine falcon! The video cameras at the nest site are in place, and the signal will be brought to the web via the Regina Peregrine Falcon Project beginning in around ten days. 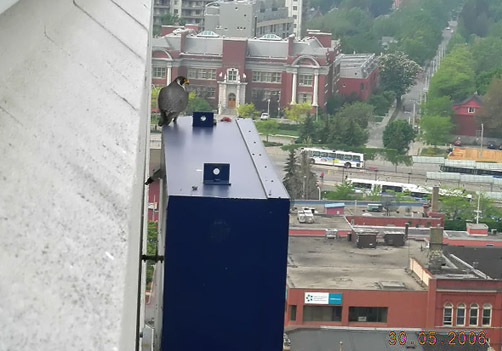 Marcel Gahbauer reports: At least one of the adult peregrines is present in Winnipeg currently, as shown by the photos sent to us by Shirley Stimpson, taken from her office window - see them in our new International Peregrine Gallery.